We woke up this Saturday morning to the sounds of nearby firetruck sirens. Just a few houses down, an older wooden four-plex turned into a blazing furnace. 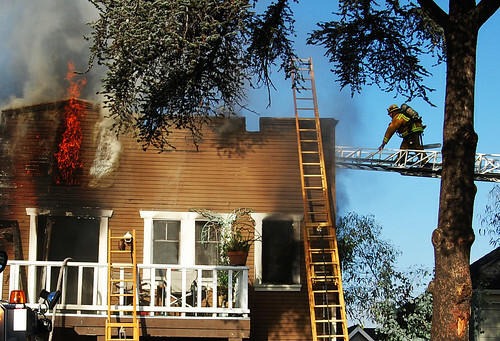 The tenants lost everything, despite the heroic efforts of our LAFD. Fortunately, nobody was hurt, and the blaze was contained quickly without any further damage to nearby buildings. The start of it all: faulty Christmas lighting. Just a reminder to check all your electrical wiring this holiday season, as all it takes is just one errant spark or overloaded outlet.